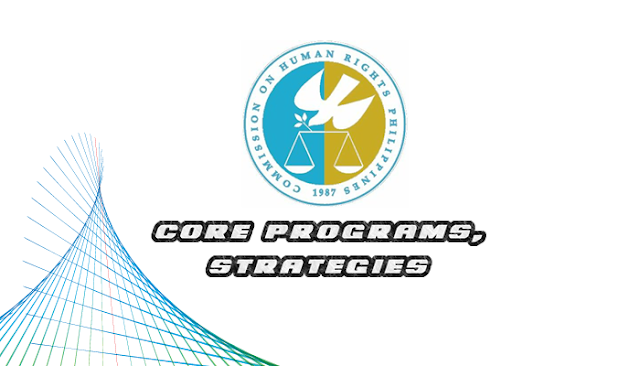 The information below contains the list of all the CHR or Commission on Human Rights core programs and strategies as stated on their official website. Please refer to the list below for more details. • Documentation and management of complaints of human rights violations – This includes the conduct of special fact finding missions, public inquiries, quick reaction response, the provision of developmental legal services, such as legal aid, alternative dispute resolution and other forms of assistance to complainants, victims, witnesses and their families. It also includes the operation of the National Monitoring Mechanism, a collaboration among the CHR, CSOs, government agencies and the security sector to end impunity. • Monitoring of human rights conditions in detention facilities and penal rehabilitation centers – As a National Preventive Mechanism on torture , this involves the conduct of announced and unannounced visits to inspect the human rights situation of persons deprived of their liberty . It also includes the provision of legal and other forms of assistance to PDLs to respond to their complaints and requests or the monitored inhumane conditions. Covered under this activity are the following: 8 National Penitentiaries, 85 Provincial Jails, more than 1,500 municipal and city jails, as well as lock up cells, rehabilitation centers, and other detention facilities. • Provision of independent forensics services and medico-legal services in aid of investigation. – This covers the conduct of exhumations, autopsies and medico-legal services and other forensics studies to provide evidence and establish the cause of death, injury or identification of victim. This requires a continuing upgrading and maintenance of the forensic laboratory, equipment and supplies and forensic training for updates of in forensic technology. • Human Rights Advocacy Campaigns – This includes the organization and mobilization of a network of public support for the conduct of human rights events and promotional campaigns and the corresponding Information, Education, Communication (IEC) materials and projection strategies for wide media coverage.